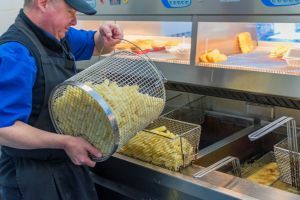 Congratulations to Carl Heery and his staff at Fairfield Plaice in Buxton on being named in Fry Magazines top 50 independent fish and chip shops for the fifth consecutive year. Carl is a long-time user of Triple F Chips and commented they were given full marks when he received the results. Carl said, “I’m delighted with the award and honoured to be the only shop to appear in the top 50 for 5 consecutive years. “I pride myself on providing great service and sourcing the finest quality ingredients for my customers.